The uncertainty index in the recent NFIB (National Federation of Independent Businesses) surveys has been at its highest in the past forty years. Except for one high point in 2012, every high in this reading has been followed by a recession. This index is compiled from responses of “I don’t know” to six questions about future sales, employment, economic conditions, and business expansion. Small businesses typically pause in the face of uncertainty, holding off on hiring and capital outlays. They must be alert to the underlying climate of their particular market or go out of business. The previous highs in uncertainty were set in late 2006 and early 2007 as the housing bubble was cooling off. A recession followed in late 2007 that lasted till June 2009. In the late part of 2000, near the end of the dot com bubble, a high in this uncertainty index preceded a recession in the early part of 2001, and a two year downturn in the market. 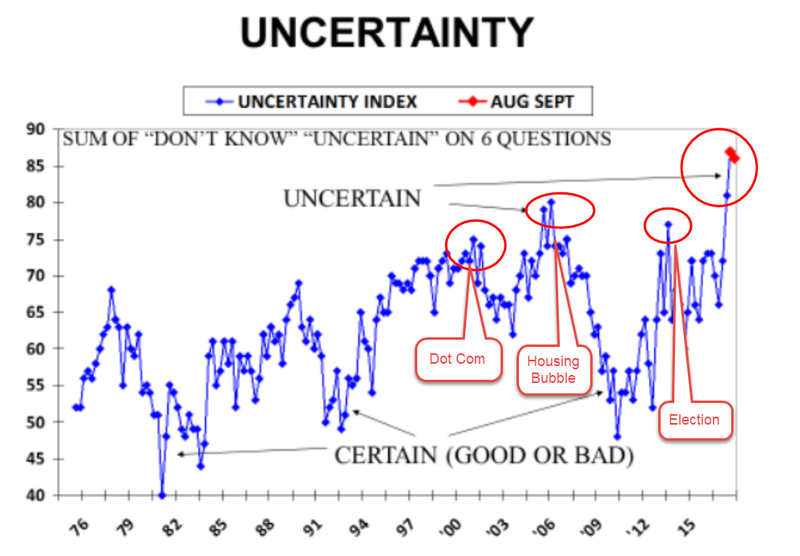 A high uncertainty reading in late 2012 was a combination of concerns about slow growth. Starting in September 2012, the Federal Reserve responded with QE3, a monthly program of bond buying to spur growth and avoid recession. When the canary sings, pay attention. Weak sales growth underlies current business concerns. September’s year over year (y-o-y) growth was 2.2%. After adjusting for inflation and population growth, sales growth was negative and has been less than 1% for two years. As I noted last week we are at the edge of a plateau. We either fly or fall from here. 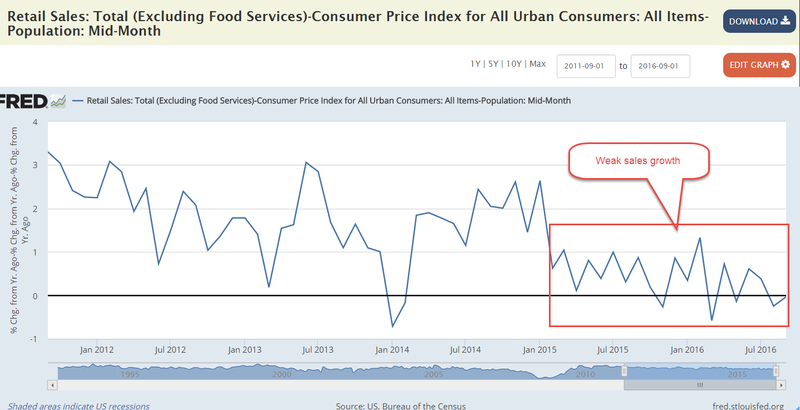 The chart below shows retail sales less food services like bars and restaurants, and is adjusted for inflation and population growth. In 2015, analysts attributed the y-o-y growth to the decline in gasoline prices, which began in the middle of 2014. Economists were asking why people were not spending the money they were saving on gas. This year’s y-o-y growth rate has little influence from gas prices, which have been higher for part of this year. People are not confident enough to increase their spending. Casual investors are encouraged to invest in broad categories of stocks rather than individual stocks, in order to minimize the effect, good or bad, of any one stock. We are in the middle of earnings season for the 3rd quarter and I thought I would point to an example of the price volatility that an earnings announcement can generate. We expect volatility from smaller companies so I will look at a “hyuge” (as Donald would say) company like Microsoft, the third largest company in the world. During the past year or so, owners of Microsoft shares have seen some gut wrenching price moves on the day when Microsoft announces its quarterly results. On April 24, 2015 the stock jumped 10% in reaction to first quarter results. Disappointing second quarter results led to a price drop of almost 4% on July 22, 2015. Another 10% jump in response to third quarter results on October 23, 2015. April 22, 2016 saw a 7% drop, July 20th a 5% gain, and a 4% gain on October 21st. The tech sector can be more volatile than the Consumer Staples (Proctor and Gamble) sector, for example. An investor who owns shares in a company should be prepared for occasional volatility. A good rule of thumb is that the value of one company’s stock should be no more than 5% of an investor’s portfolio. A safer rule might be 5% of one’s stock allotment. If stocks were 50% of an investor’s portfolio, then 5% of that would be 2.5% of the total portfolio. Here’s an interesting viewpoint by someone who argues that the stock market has plenty of room to run. However, the SP500 index has gained an average of 11% annually for the past seven years. This is far above the 6.5% annual price gains of the past twenty years, and the 7.4% yearly gains of the past thirty years. Reaching back even further, a forty year time span shows 7.85% yearly gains. However, we should take into account the much higher inflation rates of those earlier decades. Adjusted for inflation those annual gains would be much lower, making the comparison with the past seven years even more dramatic. We like to think that “this time is different,” that the rules have changed. After a sobering decline in equities, we resolve not to be fooled again and then…we forget once again. We tell ourselves yet again that it really is different this time. Shakespeare made his living reminding us of our follies. We read his tragedies, his comedies and we think yes, but that was so long ago and so much has changed since then. What hasn’t changed, what remains persistent is the nature of human beings and the eternal constant, the Law of Averages. October’s surveys of Purchasing Managers across the country, the PMI, edged down slightly from last September’s upward surge. The CWPI composite of the manufacturing and non-manufacturing PMI surveys remains at the bottom end of healthy expansion and barely below the index’s five year average. This index has had a cyclic peak and trough pattern for most of the recovery, peaking at a strong growth level, then falling to a trough that was still above the neutral line between expansion and contraction. Since February, the index had drifted in a plateau of healthy growth. We wait and see.